Fascinating! I rode the underground when I was in London last August–I miss it, too–so coming from an area where no such mode of transportation exists made the tube all the more impressive to me. If I could only be free of the wretched automobile! Even though I have yet to ride the tube in London, I miss living in San Francisco for the same reason (freedom from a car)! Interesting article! When did the term “Tube” first come about? I noticed it wasn’t used in the 1896 article, but it was in the book from 1903. I’ve always wondered who coined that picturesque term to describe the subway. 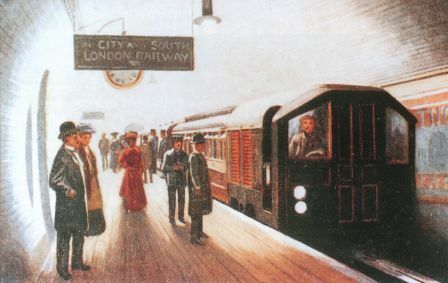 In William de Morgan’s Somehow Good, the tube is a new and exciting thing, and the story starts when a passenger is electrocuted by some loose wires in one of the cars. Wow, lol, that’s a great opening for a book!